Virtually every resident in the city of Lakewood is familiar with the local shop called “Geiger’s.” But not everyone knows the man behind the store quite as well. 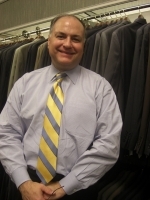 Mr. Charles Geiger III and his brother, Gordon Geiger, are partners in the store’s management. Geiger’s has been in business now for three generations. In 1932, Charles Geiger senior started “Charlie Geiger’s Haberdashery” with his brother. The men’s furnishing store was located on the corner of Detroit and Warren, just a few storefronts from the present location. It was passed down to Charles Geiger II and his brother, and then to Charles III and his brother Gordon. Growing up in Lakewood, Geiger always loved the city. He is an alumnus of Hayes, Madison, Harding, and Lakewood High School. Throughout junior high and high school, he worked for his dad at the store, but was never set on owning it one day. Geiger majored in business and economics at Wittenberg University and was interested in studying law. He took the law boards and could have gone on to be a lawyer, but got married instead in 1974, and made the decision to take over the family business and to keep his family in Lakewood. Since 1932, the store has, as Geiger says, “expanded to adapt to the changing market. We have reinvented ourselves.” Sporting goods has always been a significant element of this family business. It wasn’t until the early sixties that skiing became a popular sport and Geiger’s took full advantage of the expanding market. Thoughts for the current renovating of Lakewood’s school system began with the Board of Education. In the late nineties, money was constantly being spent to fix old buildings, and the Board realized it might be a better investment to build rather than repair. “We needed help evaluating whether we should fix the buildings or build new ones,” says Geiger regarding the Board’s earlier decision-making process. The voters approved bond issues, and the plan formulated in 2000 and 2001 is now well on its way.